Recently, my husband and I had a few quiet moments together to talk and plan for the future. Our conversation turned to our culture, to the unstable economic landscape of industrialized nations, to the rumors of wars, and to our frustrations in politics. We also thought of our personal dreams, of ways we want to invest our lives in service to the King of Kings. We discussed hindrances, such as sin, health problems, lack of financial resources, and clutter in our lives. Sometimes we look around at our home, our time, and our thought lives, and all we can see is the clutter that accumulates when we get too attached to this temporary life and too preoccupied with it to remember eternity. “All these people were still living by faith when they died. They did not receive the things promised; they only saw them and welcomed them from a distance. And they admitted that they were aliens and strangers on earth. People who say such things show that they are looking for a country of their own. If they had been thinking of the country they had left, they would have had opportunity to return. Instead, they were longing for a better country—a heavenly one. Therefore God is not ashamed to be called their God, for he has prepared a city for them” (Hebrews 11:13-16). To grow a garden this year. 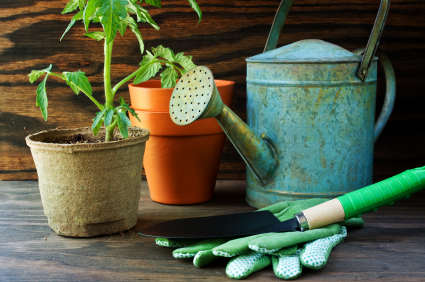 In the style of Adam and Eve (Genesis 1-4), we want to recognize the benefits of a garden, even a small one. A garden teaches us to have proper dominion over our little corner of the earth. We learn that it’s nicer to relax outside with dirt under our fingernails than inside by the TV. We learn to acknowledge God as the giver of all things and the One who causes all things to grow. We humbly ask Him to bless the work of our hands. Finally, a garden gives us an opportunity to work alongside our children, starting up conversations that point them to their Creator. To preserve food the old-fashioned way. I was reading a blog by a woman who lives in Israel, in an especially war-torn area, yet instead of living in dread of the occasional power outages and bomb scares, she quietly preserves her food the old-fashioned way, without dependence on electricity, refrigerator, or freezer space. How does she do it? She dries food and herbs, uses a root cellar, and cans with lacto-fermentation rather than a pressure cooker. She recommends the book Wild Fermentation, so I’m resolving to pull it off my shelf, dust it off, and try more ideas from it this summer. To learn how to use plants for healing. I’ve been working on this for many years now, but I was recently introduced to the world of essential oils. I love being a “newbie” at it, because everything is fresh and exciting. I’ve ordered several new reference books, I’m made new friends, and I’m discovering some very effective uses of plants. God created this world for our benefit, and I’m convinced that the best cures for disease are quietly growing from the ground. This summer, I intend to read a lot, experiment as I can, and prepare for the winter with all its accompanying colds, viruses, and sicknesses. To use resources wisely. My husband and I both noticed that we’ve been leaving lights on in empty rooms, running the water too long when we do the dishes, and making unnecessary trips to town. We’re making a concerted, family-wide effort to use God’s resources more wisely. This world is His, and He certainly owns the cattle on a thousand hills — yet we want to be faithful stewards of all that is His. These are good, Anne. Some of these we have been working on ourselves! Can I make another suggestion concerning food? Learning about foraging! It is amazing what YHWH has provided in the wild FOR FREE! Many of these things are considered WEEDS by man, but have more nutrition than what we can grow! I have been in the process of learning about foraging for a couple of years now and it is exciting and interesting. Thank you, Cindy. You’re exactly right. So how do you begin learning more about foraging? All I can say is “Amen!” to every one of your resolutions…and to Cindy’s suggestion about foraging. There are so many plants you can take advantage of. I’m trying to look them up myself. I just find it hard to identify them from pictures on the internet, although I did find a good site with plants from my region on one website. I’ve started making green smoothies every day (they make a HUGE difference in how I feel–no more pain, insomnia, etc.). So while I wait for my kale and other greens to grow (hurry up, hurry up!) I’m supplementing with dandelion greens and young green pine tree branch tips to my smoothies. You can’t taste the difference. The kids think it’s cool, lol.